For 56 years, thousands of spectators have gathered Downtown at Monument Circle to see the most spectacular holiday display illuminate. Central Indiana’s most beloved tradition is here again. 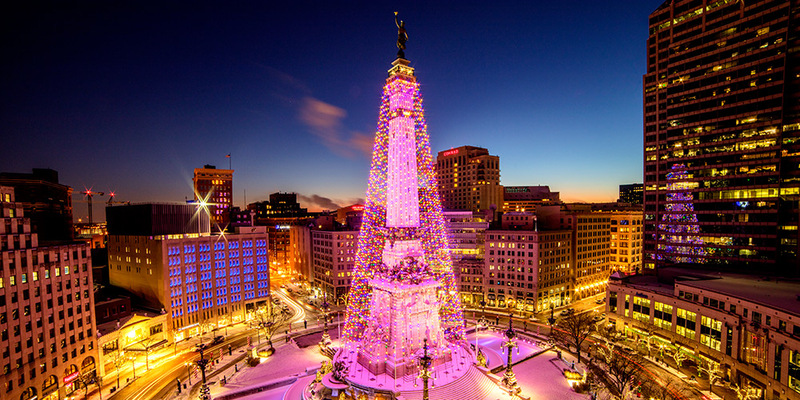 Downtown Indy, Inc.’s Circle of Lights® presented by IBEW #481 will take place the day after Thanksgiving. More than 100,000 spectators are expected for the free ceremonial lighting and holiday kickoff on Friday, November 23. Festivities begin at 6 pm, with the live televised show running 7-8 pm on (NBC) WTHR-13. The Monument light-up will occur at approximately 7:55 pm. And who gets to “flip the switch?” Each year, a lucky child is chosen from the Carson’s Coloring Contest to help Santa illuminate the night. To conclude the evening, watch the sky for a spectacular fireworks finale.